Excuse Us, But We’re Rafting Down the Delaware! Guess who? Never in a rush to leave the starting point at Pond Eddy, Lumberland, NY. It’s the annual “rafting trip” with my retired educator cronies. We start at the boat rental called Indian Head Canoes & Rafts, Barryville, New York, in two rubber rafts tied together! We head down nine miles of beautiful and scenic New York State waters of the Delaware River. Beer is a must to wash down every form of pork and pepperoni known to man and clogged arteries as well! The bonding thing among old friends is what it’s all about! As you may remember, we lived close to the Delaware for 35 years. We put our truck-tire pool tubes in the river and floated down from Lambertville Wing Dam to Ewing where we’d left one of our cars. A non-person tube held the lashed-on cooler with our drinks (always important to keep hydrated). Sometimes we used the canoe to accompany the floats. It was always a lazy day. If you come up here to Maine, we have a raft that we can pull behind our boat. The water in the Kennebec is often 10-15 degrees warmer than the Gulf of Maine, depending on the way the tide is flowing. C’mon up and try it out! Then we can chug off around a couple of islands to our favorite lobstah dock. Summer’s are great! Oh, Happy Days! Phil, it brings me back to my youth. Our get a ways from the social stresses in little old Winfield. That’s right. Back in the early 1960’s we would have make shift yachts. Tied a couple of railroad ties tied together and would pole and coast around the town. We would pack with Ring Dings, and boiled eggs and Pepsi.A couple of milk crates for deluxe seating. e What and escape. Hours of enjoyment. Singing and eating and catching frogs and yes, a little fishing for the Carp. What a delicacy. Almost 50 years ago. Enjoy and be careful my friend. Hi Phil, Hope the weather held up in Barryville,NY. Mass on June 2 is getting a good old Spring, NorEaster. Today: A chance of drizzle between 11am and 1pm. Partly sunny, with a high near 75. West wind between 5 and 9 mph. Tonight: Partly cloudy, with a low around 47. West wind between 4 and 7 mph becoming calm. Sunday: A chance of showers, with thunderstorms also possible after 3pm. Partly sunny, with a high near 75. West wind between 6 and 14 mph. Chance of precipitation is 40%. New rainfall amounts of less than a tenth of an inch, except higher amounts possible in thunderstorms. Sunday Night: A chance of showers and thunderstorms. Mostly cloudy, with a low around 51. West wind between 3 and 8 mph. Chance of precipitation is 30%. New rainfall amounts of less than a tenth of an inch, except higher amounts possible in thunderstorms. Hope the forcast was correct for the first part. Be careful, Peace, Pacheek. I used to go rafting down the Guadalupe River in Central Texas, Austin to New Braunfels, 1968-1993. 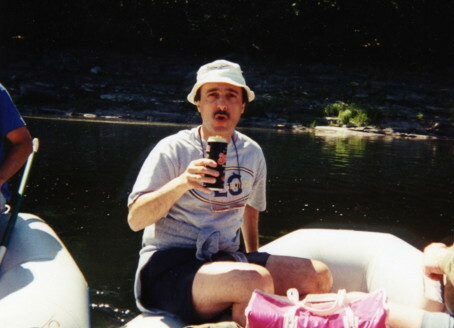 After all that experience, when I moved to San Diego in 1993, some friends wanted me to go rafting with them down the American River near Sacramento. Ha! After that experience I realized that there is a big difference between coasting down a calm river on an inner tube while drinking beer and actual rafting!